This observation crosses over a part of the hemispheric dichotomy boundary on Mars which separates low-lying northern plains from older southern highlands. In the northern part of the scene, much of the surface is covered with small boulders, most only 1 to 2 meters wide (1 meter is approximately 1 yard). In other areas, it appears that sand or dust has accumulated in depressions, forming light patches. 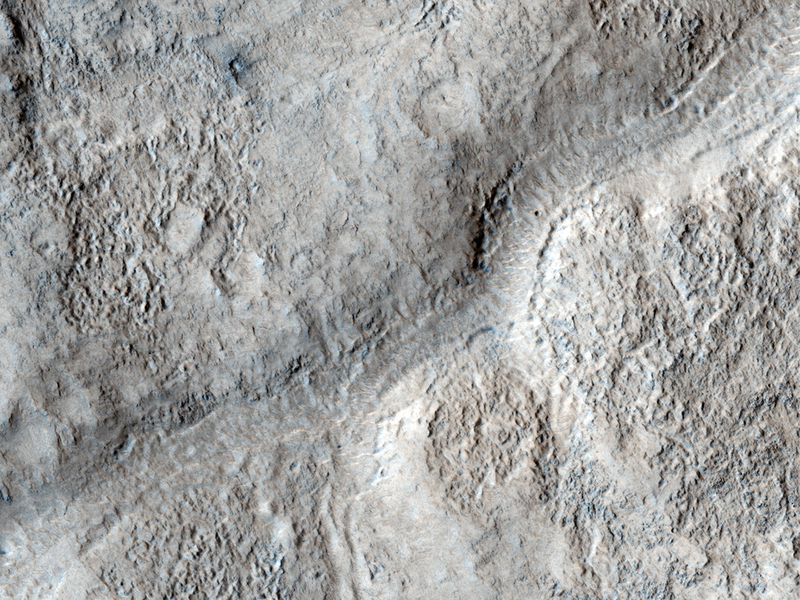 These areas also show short sinuous or linear features, likely ripples formed from wind-blown material. The southern part contains an old valley, now mantled by later deposits, and has a pitted texture due to erosion. It has been proposed that the lowland was once filled by an ocean. In this case several arcuate or linear features along the boundary slope could be old shorelines, but this interpretation is still debated. The features have been modified by erosion, and in some cases appear to slope towards the highlands. This is a stereo pair with PSP_001968_2165.